Live floristry on the Highest Level in the FDF World. 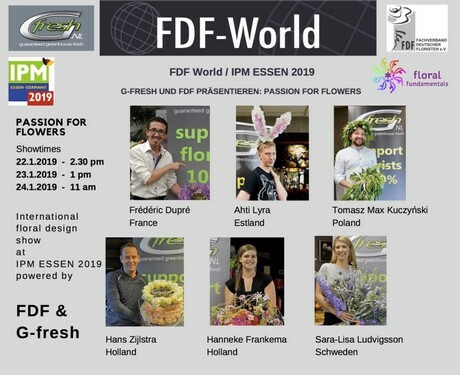 The team from Floral Fundamentals announce that together with Fachverband Deutscher Floristen (FDF) and G-Fresh the big international floristry show – Passion for Flowers – is presented at the IPM. Each day it will be showtime on the main stage in FDF World. Five famous Floral Fundamentals designers will be doing three different demonstrations and being passionate about bridal work. The floral designers Frédéric Dupré from France, Sara-Lisa Ludvigsson from Sweden, Hanneke Frankema and Hans Zijlstra from the Netherlands, Tomasz Max Kuczynski from Poland as well as Ahti Lyra from Estonia will present innovative wedding decorations and extravagant floral creations. Moderation by Alison Bradley (Floral Fundamentals) and Timo Bolte (Timo Bolte Floral Design). Seating is limited so come early to watch the G-Fresh/FDF/Floral Fundamentals demonstrations and visit the G-Fresh stand where there will be on-going mini demonstrations and forums with Ambassadors and Partners.